Is there a possibility in FOUNDATION Pro to calculate a foundation slab with four support points to an entire plate? 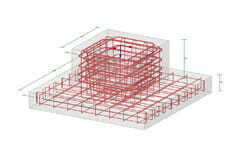 The program FOUNDATION Pro allows you to design bucket and block foundations at nodal supports. You can also design foundation slabs, but only for individual columns. A foundation plate with several supports on a an entire plate cannot be done in this way. This is because for a pure design of the column supports, the interaction with the other columns and the bearing behavior are not considered. To design the entire foundation plate, the finite analysis program RFEM is the right choice. In RFEM, you can, for example, import the RSTAB file, extend it with the surface of the foundation plate, and then design it.